At dinner on our only date, Joanna the biotech professional was all about telling me how smart she was. She said, "I turned down work at MIT to come out here. I thought it would be better to start as the biggest fish in the pond, you know?" "I guess that makes sense," I said, trying to figure out why it made any sense at all, "Where'd you do undergrad?" "Harvard. I was a quadruple major." Momentarily stunned, I asked her, "What were your majors?" "The big four: English, history, science, and math." She then pulled out a folded piece of paper, unfolded it, and showed it to me. 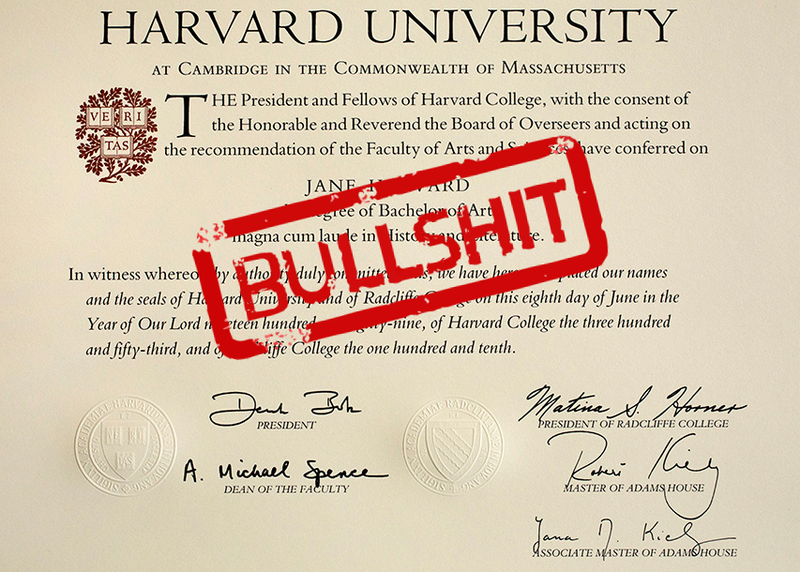 It looked like a fake diploma you make for yourself when you're 12 on one of those old Broderbund print shop programs. It said Harvard on it sure enough, and even had original signatures on it. At the bottom it said, "Majors: English, History, Science, and Math." Realizing I was dealing with someone who had a couple of screws loose, I asked her, "You carry your original diploma around with you?" She folded it back up and put it away. "No. That's just a copy." "Because those signatures looked like originals." "Can I see it again?" "No. I went to Harvard." We didn't go out again. She went to Harvard, op. Haven't you heard of the prestigious and long established Havard School for the Criminally Disturbed? Tyra Banks also "went to Harvard". Maybe they know each other. Next time OP, point out the watermark to her. I initially read that first line as "Joanna the biotch." Bit harsh, I thought.